Slightly tweaked light mesh to make Face Light lighting more closer of portrait lighting photographic technique. Thank to tktk1 for Face Light mod and to authorize me to publish this file. The original face light was great but the shine was too strong, seemed aimed straight at your face. 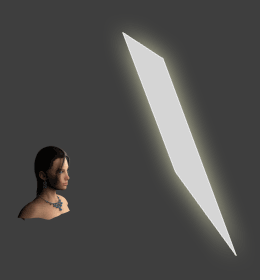 This mod provide a slightly tweaked mesh to make Face Light SE lighting more closer of portrait lighting photographic technique and makes face lighting less artificial. wall...). It makes shadows and contrast a little bit softer, face more beautiful and reduces the white glowing nose effect. Side effect : Dark version is more subtle and seems darker. The difference is more noticeable in game than on the provided screenshot. 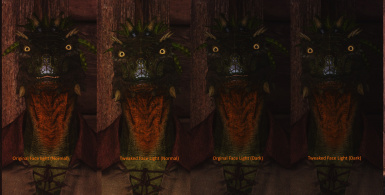 Results are very dependent of the enb preset and lighting mod you used. Download my mod, overwrite if asked.